In the spring Chateau Farms offers a wide variety of vegetable and herb plants, annual bedding flowers and hanging baskets. 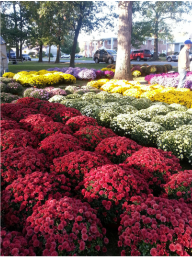 During the fall months, we offer fall mums and asters. We can be visited at the farm or at local festivals. Check out our Schedule of Events and Festivals to see where we will be.